Angolo di Modo Men's Haberdashery & Style weekly tip series recommends one of our favorite hat styles: The Homburg. The Homburg is a formal men's felt fedora style hat. Lesser-known, we consider it to be a staple in the classic gentleman’s wardrobe. Three attributes distinguish the Homburg from the typical fedora: The "gutter crown" or u-shaped wedge down the center, a stiff piped brim called the kettle curl, and bounded edge trim. In addition, a grosgrain hatband and brim trim is typically is a signature feature of the Homburg. Named after Bad Homburg, a spa town in Hesse, Germany, the hat became popularized by England's King Edward VII at the fin-de-siecle when he returned from a trip to Germany sporting the lid. During the early twentieth century, the Homburg became popular amongst American businessmen and mobsters. 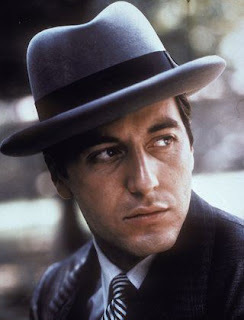 It is also called a "Godfather" fedora because Al Pacino's Michael Corleone character wears one in The Godfather movie. The Homburg's popularity waned along with men's hat culture in the 1960s, but it remains a cache item amongst the sartorial cognoscenti. We recommend the iconic Homburg for your formal attire. It is not as extravagant as the top hat and more appropriate then then the popular stingy brims men wear today. Purchase a Homburg at a respectable hatter such as J.J. Hat Center on Fifth Avenue at 33rd Street in New York City. The dog days of summer can be brutal! How does one combat the inhospitable heat and lazy days of late August and still enjoy a fine libation? This type of weather demands refreshing cocktails that should be light, effervescent, and above all thirst quenching. For starters, there should be less alcohol in these drinks and more refreshing modifiers such as fresh citrus juice, sparkling sodas, and fresh fruit. I can wait until mid-September for a Manhattan thank you very much. As summer’s last call approaches (a.k.a Labor Day) we getting our fill of classic seasonal cocktails such as the London Buck. The Buck is a long drink that was once a summer time staple along with the Collins and Rickey. The Buck is a cousin of the highball cocktail and is generally constructed with a base spirit (such as Whiskey, Gin, Rum), a splash of lemon juice, and ginger ale over ice. The London Buck was created by legendary barman Harry Craddock of the Savoy Hotel Bar during the 1920s and became a Prohibition favorite in the United States. 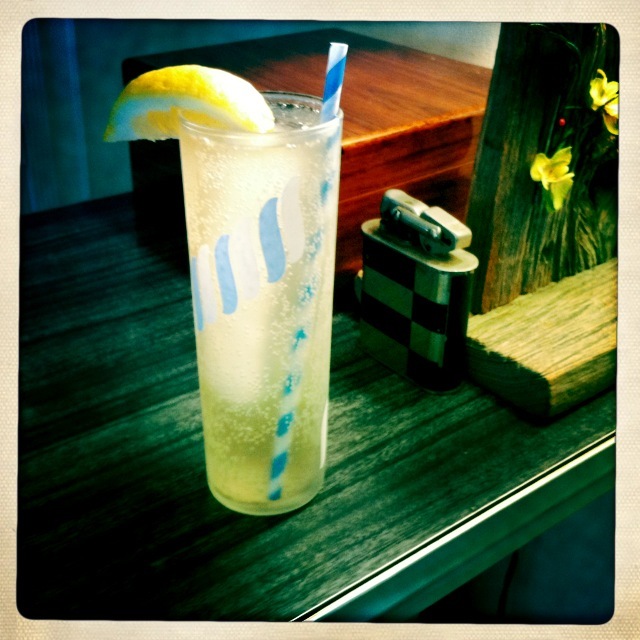 Method: Squeeze a half a lemon into a Collins or highball glass and add then gin. Add large ice cubes and then top off with pale ginger ale, stir and serve. Garnish with lemon wedge. In recent years, bartenders have pushing the boundary of the classic buck formula by substituting spicy ginger beer or ginger syrup/club soda in lieu of ginger ale. I have also seen other citrus being used, including lime juice and fresh sour mix. Below is a variation I adapted from the London Buck using dry gin's predecessor from across the English Channel – Genever and ginger beer. Method: Squeeze a half a lemon into a Collins or highball glass and add then gin. Add ice cubes and then top off with ginger beer, stir and serve. Garnish with lemon peel. Angolo di Modo Men's Haberdashery & Style weekly tip series continues with our recommendation to consider "the fabric of the gods" this Fall: vicuña wool. Noticeably different and softer than any other wool, vicuña (pronounced vee-cun-ya) is the softest wool in existence and the smallest fiber capable of being spun. Loungerati's style guy, Eff, has a sport coat made of vicuña and swears that the fabric is insanely warm and supple. It is so dissimilar to regular wool that people insist on a second touch but cannot place the fabric. Higher end designers such as Kiton of Napoli are fond of using the coveted fiber. The vicuña is part of the camelid species and is relative of the llama. It is also the national animal of Peru. They live on the grasslands of the high Andes in Peru, Chile, Bolivia and Argentina at an altitude of up to three miles above sea level. The wool is gathered from the back and neck of the beast. However, the vicuña wool can only be cultivated in the wild as the animals are know to starve themselves to death in captivity. Peruvian peasants gather the wool using a centuries old communal herding method called the chacu. In the chacu ritual, hundreds of farmers form a circle by joining hands around a vicuña herd. They corral the animals into clusters, shear them, and release. A single vicuña produces just one pound of wool and it can only be gathered from one animal every three years. As you can imagine, this makes farming the animals impossible and production low. In the 1970s, the number of vicuña dropped under 10,000 animals so the United Nations stepped in and made any trade of these endangered animals illegal. Twenty years later, their numbers returned acceptable levels and trade has resumed - but at a price that keeps production relatively low. In 1993, Peru formed the National Council for South American Camelids (CONACS), which was charged with overseeing Peru’s vicuña preservation program. Today there are around a quarter million vicuña in the Andean region. This Autumn, get your mitts on a vicuña wool scarf or a sports jacket if you can swing it. Due to the limited production of this high quality wool, vicuña can easily cost its weight in gold! Angolo di Modo's Men's Haberdashery & Style weekly tip kicks off with functional cuff buttons or "the surgeon's cuffs". Cuff buttons on suits may have first been used functionally in Germany around the 13th Century; their origin is unclear. There are various theories behind the practice: surgeons rolling up their sleeves or laborers rolling up their sleeves make the most sense. We have also heard that they were introduced by the Royal Navy to prevent midshipmen from wiping their nose on their sleeves (though that last one screams a Snope write-up). Today, some suit makers (typically haberdashers specializing in high end bespoke or made to measure apparel) still "work it" into their designs. This practice also extends to men's overcoats. We suspect overcoats ALL had functional cuff buttons at one time for the same reason shirts still do: ease of donning and removal. Once it became cheaper to mass produce coats with just cosmetic ones, that became the norm. One could argue that functional suit cuff buttons in the modern age is ostentatious. Heck, sleeves buttons real or cosmetic technically are not needed at all - even a snot nosed midshipmen could tell you that! Our position is we would rather have buttons that work and the option to roll up the suit sleeve to keep both shirt and suit clean. A friend of ours who will remain nameless (his last name translates to 'rickety old wagon' in Polish), thinks unbuttoning only the first button as the Italians are known to do is completely unnecessary and showy. We disagree and think of it as spreading the gospel of sprezzatura! Let's get the functional button back on suit cuffs and not make it an indulgence of the well to do.